An Evening Of Creativity that took place at Oikos Cafe in 2018. Hello All! 2017 was a fantastic year for CAFÉ Arts, with the organisation continuing to successfully champion the arts within our little corner of North Birmingham. Our Evenings of Creativity have gone from strength to strength, and the format has spread to a number of different venues. Most pleasingly, we have been able to bring these events to some of the further-flung reaches of Erdington constituency – to wards such as Kingstanding – which fall firmly within our jurisdiction and thus deserve our full attention. 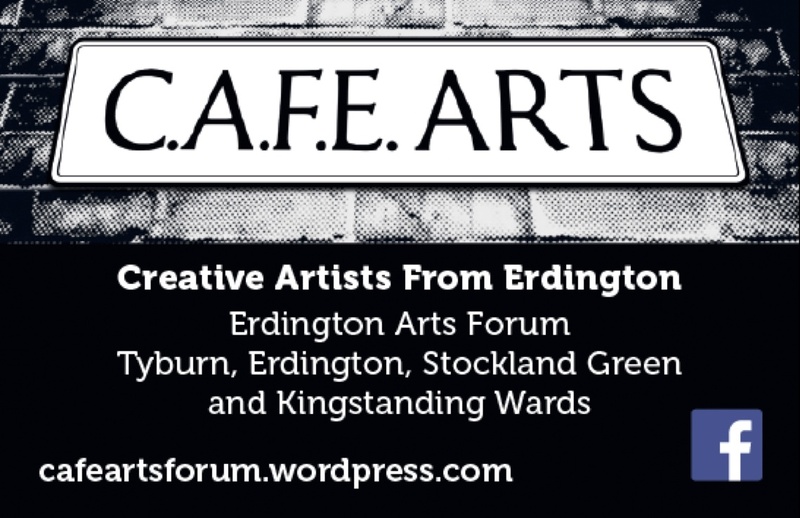 A new year is upon us, and 2018 is off to a bright start – both for the arts forum itself and for the arts within Erdington more generally. There are a number of events happening over the next few weeks that will be of interest, and you can find details of them below. 1st February – On Thursday 1st February you have the opportunity to see local Irish folk band Hooley play at Kingstanding’s oldest building! The Maryvale Institute, located on Old Oscott Hill, which has a history dating back to 1794, and this will be an incredible opportunity to witness excellent live music in a truly historic setting. 8th February – Following on from our previous collaborations with BRAP human rights group, there will a discussion about homelessness at 6pm on 8th February at Six Ways Baptist Church. The issue of homelessness is particularly pertinent at the moment, with figures released this week showing that levels of homelessness have risen annually for the past 7 years. Come along for the chance to express your views on one of the UK’s most pressing issues. This event will be followed by an open mic night at the New Inns, run by EoC regular Ish Murphy. The open mic will begin at 8.30 and is bound to be night brimming with local talent. Ish has supported the Arts Forum immensely, so please do support his event if at all possible. 16th February- We will be back at Oikos for our monthly Evening of Creativity. Confirmed acts so far include Angry Fish and Michael Bennett. Look out for more line-up announcements closer to the date. Beyond February, we will be having our firsr Castle Vale EoC on March 2nd, and the March date for the Oikos EoC is set for March 16th. As always, anyone who would like to be involved by way of volunteering or performing is encouraged to get in contact with CAFÉ Arts, there are always opportunities for people to get involved! Never heard of CAFE Arts till today (23rd Sep 2018) & I’ve lived in Erd for, um, >35 years! Great idea, yae! I hope events are going to be at many places not just at Oikos tho. Hey Tatty. Yep! We’re doing events at Castle Vale, New Inns, Kingstanding, Polish Cafe, various other places. To keep up to date, i’d recommend checking out the instagram, facebook or twitter!